Thank to Assoc. 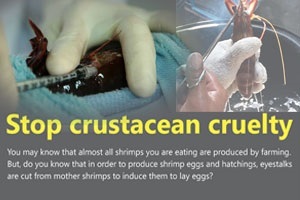 Prof. Apinunt Udomkit and Dr. Supattra Treerattrakool and their research team, this cruel practice will be soon replaced by a more humane method of injecting RNA and/or antibody into mother shrimp. The technique is based on disruption of gonad-inhibiting hormone produced from shrimp eyestalks. This hormone inhibits development of ovary and eggs. Cutting eyestalks results in reduction of the hormone level and development of ovary and eggs. Fortunately, there are other ways to disrupt the hormone. The research team has developed alternate techniques utilizing either a double-stranded RNA or an antibody that specifically counteracts the function of gonad-inhibiting hormone. At the experimental scale, egg development and laying can be achieved by injection of these substances into the mother shrimp without cutting the eyestalks. The team is now developing a method to deliver double-stranded RNA and/or antibody that is more practical for shrimp production in the hatcheries. With the support from several granting agencies and collaboration with private companies and shrimp hatcheries, they are able to test and compare the production yield of this new method with the cutting of eyestalks in order to find the best condition. Hopefully, this new method to induce egg laying in the shrimp will be well established with comparable efficiency to conventional eyestalks cutting in the near future. Treerattrakool S*, Boonchoy C, Urtgam S, Panyim S, Udomkit A. Functional characterization of recombinant gonad-inhibiting hormone (GIH) and implication of antibody neutralization on induction of ovarian maturation in marine shrimp. Aquaculture. 2014 May 20;428-429:166-173.